Are you looking to buy a Solar Gate Opener? Or should you stick to a regular Electric Gate Opener? 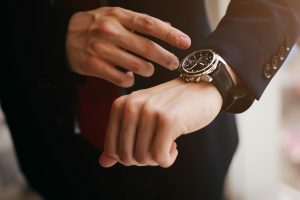 Need more information to help make your decision? We've created this detailed guide to answer all of your questions about the Best Solar Gate Openers. Check out the Pros and Cons, and Customer Reviews for the best brands of Solar Gate Openers from Mighty Mule, Aleko, Ghost Control, LiftMaster, US Automatic and more. Finally, explore different types of Solar Gate Openers such as automatic and battery operated residential dual swing, single swing, Solar sliding gate and estate solar gate openers. Here are our quick navigation links to quickly find the info you need. 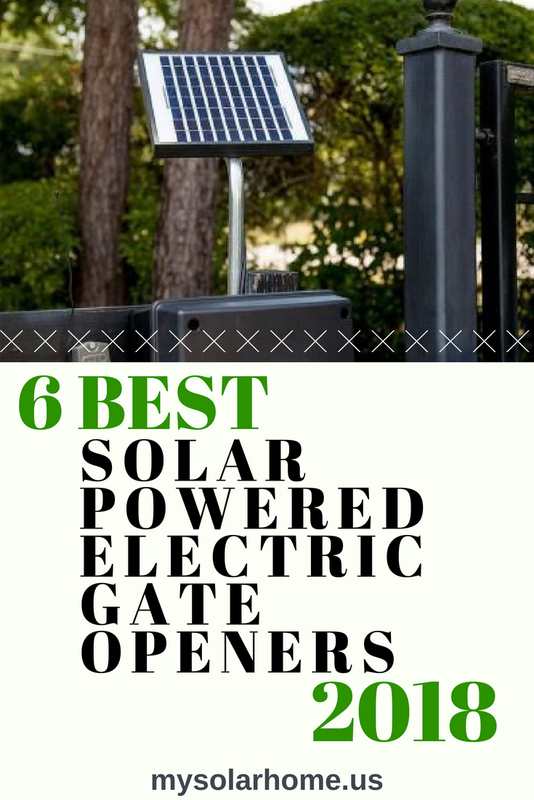 These 6 Solar Gate Openers have outstanding reviews and have the highest sales volume amongst all Solar Gate Openers. 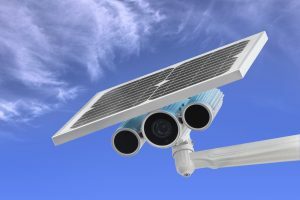 What are Solar Gate Openers? Solar Powered Gate openers are an excellent choice when your gate is at a significant distance from an electric line. 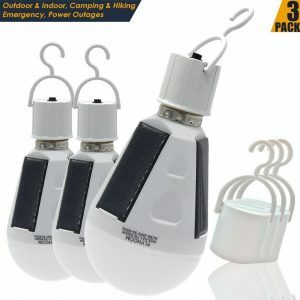 As they are powered by the sun and the energy stored in their batteries, they don't require a power line hook up. Since Solar Gate Openers rely on the sun and the battery, they are not very good for heavy duty usage. 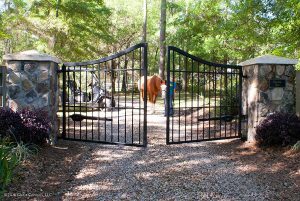 Homes and Farms that have limited daily usage of their gate openers are the ideal candidates. Solar Powered Gate Openers are automatic gates which make the business of opening and closing all types of automatic programmable battery based motorized gates like single and double swing and sliding a breeze in all weather conditions. Anyone thinking of an Electric Gate Opener should definitely consider the Solar powered Automatic Gate Opener alternatives. We have collated Customer Reviews of the most popular models in the market. There is a good FAQ section following the reviews. 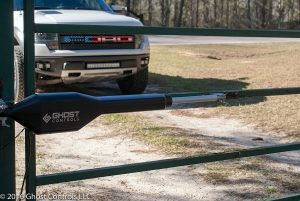 See this featured Ghost Controls Solar Gate Opener by clicking on this link Solar Gate Opener. Electric Gate Opener Alternative : Solar gate openers allow the solar sliding gate to open with the push of a button or security code in the pre-programmed keypads. 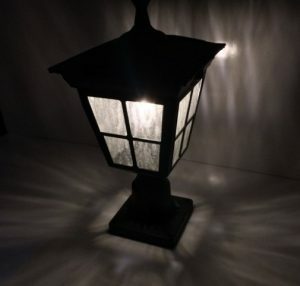 They are used in businesses like storage units, apartment complexes as well as larger homes: any business or home where security and convenience are important. These Automatic Solar Openers are now common in both urban and rural surroundings. Solar Panel : The idle current requirements of the gate opener motor determines the size of the solar panel. Manufacturers like Mighty Mule size them for best efficiency or give you recommendations and you don’t have to bother about the sizing of solar panels for your solar sliding gate. Controller : High Efficiency Control Boards optimize the output from your solar panel and you can make do with smaller solar panels. They also affect other gate opener components like the low power loop detectors and the digital keypads. Batteries : You will likely have to buy batteries separately for your solar sliding gate. Always prefer the Lithium Ion battery given the choice of two equally powerful options. The extra cost of the Lithium Ion battery is more than offset by their much longer life span. Energy Consumption : The best Solar Powered Gate Openers all have excellent energy management. These Gate Opener delivers power when it is needed and minimize energy consumption at all other times for reliable long lasting operation. Tax Credit for your Solar Gate : All Solar Purchases including your new Automatic Solar Gate Opener is eligible for a 30% tax credit. The tax credit on your Solar Gate makes them an even better bargain. Here is a link to the IRS form to claim the tax credit. Deep Cycle Batteries : Some Solar Openers may not have Lithium Battery options. The next best choice are heavy duty deep cycle AGM batteries. Marine and RV batteries with the deep cycle prefix are the best choice for your solar gate opener. 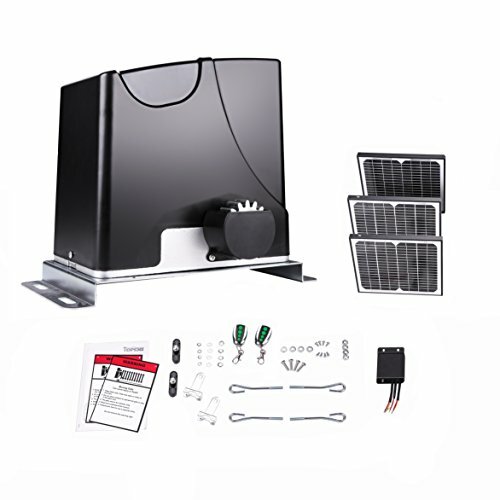 Solar Gate Parts: Make sure you look at the installation kit instructions for your solar gate opener and ensure there are no missing pieces. Installation brackets, screws, solar panel connectors for the solar gate opener’s solar panels, battery connectors and so on and so forth. Solar Gate Connectors : The solar gate is powered by an internal motor which is wired to the battery. The battery is connected to the solar panels. 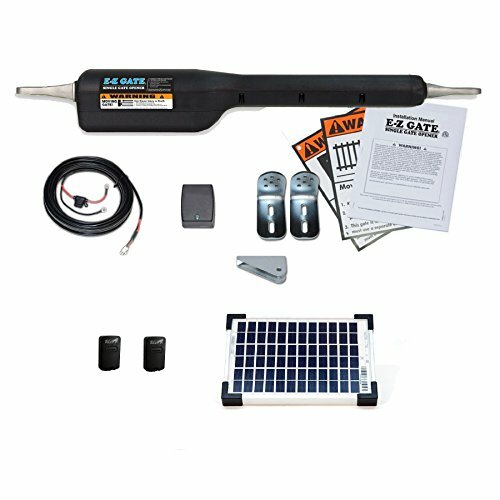 Some Solar Gate Opener kits may not come with solar panels or batteries. They might need to be purchased separately. Care for Solar Gate Motor : The wires connecting to the motor are exposed to the elements and their connection into the motor must be protected. Motors have openings for water to drain out. Always make sure the wires are connected slightly lower than the water drainage openings so that water drains away and out of the unit. While deciding on the automatic solar gate opener, you need to decide on the type of gate : a sliding gate or a swing gate or a dual gate. Sliding Solar Gate Kits : These are built parallel to your main fence walls and slide in and out parallel to the main fence. They take up the least space and have just once moving gate. Swing Gate Solar Gate Openers : The Swing gate opens towards the street and swings back to close. They have an underground sensor which will sense a vehicle when it arrives and open the gate. Once the vehicle enters the compound, the gate will automatically close. Dual Swing Solar Gate Opener : The dual gate openers are automatic swing gates with two swinging gates which open outwards towards the street side. Like the swing gate they use sensors to open and close depending on proximity of a vehicle. The Mighty Mule EZGO Single Swing Gate Solar Gate kit package consists of the Solar Gate Opener, a 5 watt Solar Panel and Two Remotes. It’s perfect for all kinds of Single Swing Gates such as Chain Link, Tube, Panel, Vinyl, Wood or even Ornamental. The constraint is a maximum gate length of 16 feet or weight of 550 lbs. A 12 volt Auto or Marine Battery will be required for an easy DIY set up. An interactive DVD as well as Youtube Videos make installation a cinch. No electrician required nor any welding. Dodd T, WA : I installed my first Solar Gate – the Mighty Mule over the weekend. Instructions were good and I carefully took my time installing the unit. Winters in WA are cold and so far my 5 watt panel is holding up well and trickle charging the battery. I have added an additional 15 watt panel to make it more robust. The Solar Gate Opener Motor seems to be fairly sturdy though it is noisy and a little slow. I tested the remote from a hundred feet away and it worked perfectly. I added a key pad and an electric lock. The keypad is for guests. Overall so far very happy with my Mighty Mule solar gate and everything works as advertised. 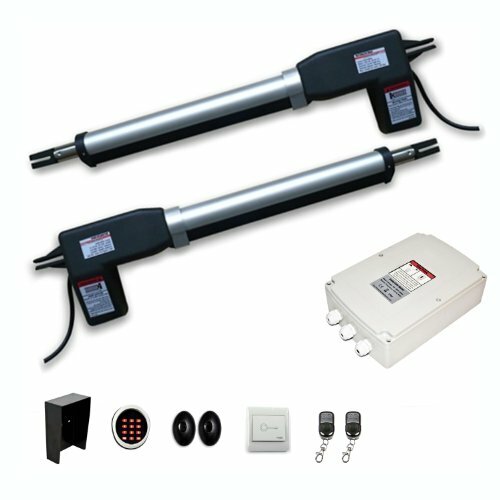 The Ghost Controls TDS2XP Solar Gate Opener is designed for Dual Swing Gates. The Gate opener kit consist of a 10 watt solar panel and connecting cables,a lockable system control box, installation hardware and two AXS1 3 button Remote Transmitters. The kit is optimized for all dual swing tubular style gates. The maximum length of each gate must not exceed 20 feet or max weight of 900 lbs. A 12 volt Auto or Marine Battery has to be purchased separately. Installation is fairly simple and there are many DIY videos on Youtube. B Gray, NY : I took the Solar Gate Opener project seriously and I did a lot of research and read a lot of reviews. 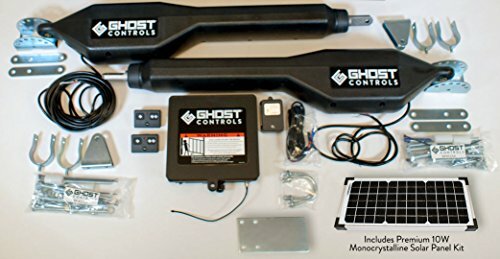 I chose the Ghost Controls Solar Gate Opener as it had great reviews and it was the best value for money. My unit includes the heavy duty double gate powered by a 10 watt solar panel. The key pad, driveway sensor and the battery holder were all at around $ 1200. Since the comparative kits with all these items were costlier my decision was easy. I installed the Solar Gate Opener myself as the instructions were excellent. I used PVC conduits to run the electrical cables to all the components. The control box is solid secure and keeps dry. The wireless key pad is super. The gate actuators are top quality and the controls options like how long the gate stays open, setting the endpoints etc are simple to set up. 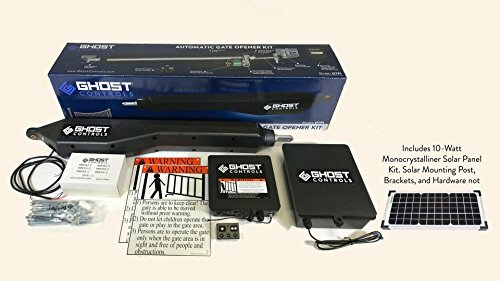 The Ghost Control Solar Gate Opener has been running without a problem and its long range remote, close to 500 feet, the two remotes and the Auto Open Feature on Departure are really nice. I am really happy with this solar gate opener. 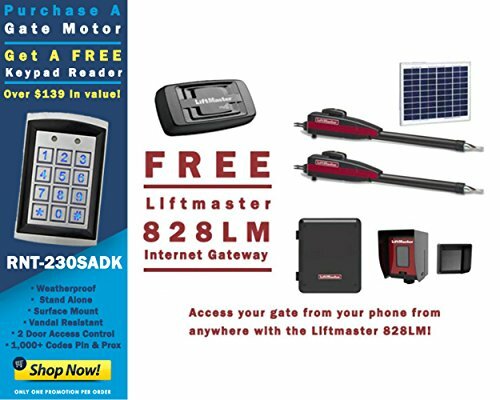 The Liftmaster LA412PKGO Dual Swing Solar Gate Opener kit includes a Solar Panel, the Internet Gate Keyapad which allows Phone access to your gate opener and a large LED diagnostic display. It’s perfect for all kinds of Dual Swing Gates and is programmable for immediate closing and anti tail gate feature to prevent unauthorized entry. 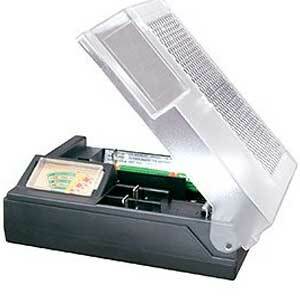 External Batteries are required for this Solar Gate Opener Kit. LiftMaster has good phone support and instructional material with their kits. The Aleko AS1200ACC Dual Swing Gate Solar Gate Opener is can power dual gates with each gate upto 10 feet long or weighing upto 660 pounds. 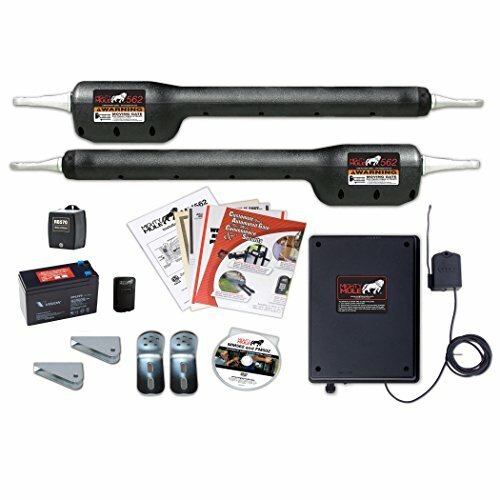 The Gate opener kit consist of two remotes, a push button wall control pad and the two DC powered gate opener motors. 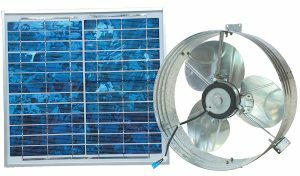 The kit is optimized for solar, but Solar Panels and the Battery unit must be purchased separately and are not part of the kit. 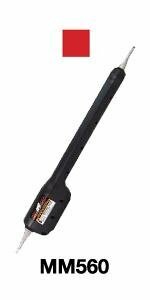 Solar Gate Opener Review by H Gibbs, SC : I have a 14 feet dual swing gate. I installed the gate with stainless steel bolts, washers and lock nuts to avoid rusting. My Solar Gate control box is a distance away from the gate, about 75 feet. The wiring needs trenching and you should use 1.5″ PVC conduit. The Aleko solar gate opener ships with two remotes which work great upto 90 feet rom the gate, an alarm light and an infrared sensor. The power cord wire was not included and I had to buy some other wires as well. Once installed you have to program the solar gate opener. This requires careful reading of the instructions – dont do this in a hurry. The instructions are good but long. My Solar Gate Opener is working really well and I think my $1500 total cost was steal. I am glad I did not engage one of the contractors who bid upto $5000 for the Solar Gate opener project. See the Mighty Mule Solar Gate Opener on Amazon. TOPENS DK1000S Solar Automatic Rack Sliding Gate Opener for Slide Gate Up to 1600 lbs and 40ft, 30W Solar Panels Included. 1) Energy Save, compatible to solar system (not included) -DK1000S electric sliding gate operator is featured by its power saving and Environment friendly. 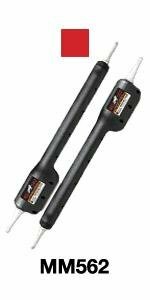 The 350W motor operate sliding gate up to 1600 lbs weight and 40 ft long. 2) Two type alternative power selection- either by the AC source or by the battery/solar system (battery is not including). 3)Quick Selection and Midway mode -- Smart design for quick change the open/close direction during installation and for midway function to decrease your heavy work and save your valuable time greatly . 5)Safety -- Auto-Stop /Reverse in case of obstruction on closing/ opening for safety protection. The new MM560 features Mighty Mule's exclusive Dual Sense Technology that meets UL325 6th Edition Standards for additional protection & safety. Designed for heavy duty single swing gates up to a maximum of 18 ft. long or maximum of weight of 850 lbs. Ideal for the DIY (Do It Yourself) property owner, the MM560 comes equipped with detailed instructions & unlimited access to 24 hour technical support. Includes: MM560 Gate Opener, 20W Solar Panel and hardware/wires, Single button remote, AC transformer, control box, all required hardware, and a detailed installation manual. The new MM262 features Mighty Mule's exclusive Dual Sense Technology that meets UL325 6th Edition Standards for additional protection & safety. 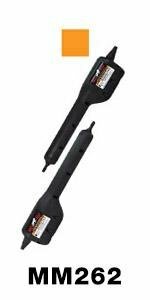 Designed for light duty dual swing gates up to a maximum of 12 ft. long or maximum of weight of 300 lbs. per leaf. Ideal for the DIY (Do It Yourself) property owner, the MM262 comes equipped with detailed instructions & unlimited access to 24 hour technical support. Includes: MM262 Gate Opener, 10W Solar Panel and hardware/wires, Single button remote (Model # FM135), AC transformer (Model # RB570), control box, all required hardware, and a detailed installation manual. 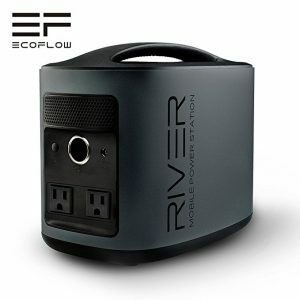 Required: 12 Volt Automotive or Marine Type Battery that produces a minimum of 250 cold cranking amps (sold separately). Optimized for Decorative Gates and is perfect for installation on any swing-type gate up to 900 lbs. or 20' in length including tubular, chain link, or plantation style gates. Not intended for use on solid-panel gates. All necessary installation hardware and fasteners are included. Easily installed with commonly available tools. No welding or high-voltage electrical connections are required. Limited Lifetime Warranty on Motor and Gear Assembly. System Certified to UL325 7th Edition Standard (in effect August 1, 2018). ETL Listed. Kit includes battery box with one 12V 7Ah sealed lead-acid battery and battery harness, one 10W monocrystalline solar panel and mounting bracket, one AXP1 Premium remote transmitter, control box with system controller, all mounting hardware, and instruction manual. Which Solar Gate Opener is right for me? The right solar gate opener depends on the type of gate you plan to install the solar gate opener for. If you are planning to install a brand new gate, here are a few guidelines. Swing Gates typically use less power than Sliding Gates. A higher power Sliding Gates make more sense in colder climates when you might have snow in your driveway or in very windy locations. Next what are the dimensions of the existing gate? And finally what is the length of the gate? All these elements will determine your choice of Solar Gate Opener. The two top brands of Solar Gate Openers have been classified according to gate type, dimension and also weight to make it an easy choice for your solar gate opener. Click here to go to the Solar Gate Opener comparison table by brand. Which safety features should I look for in my Solar Gate Opener ? 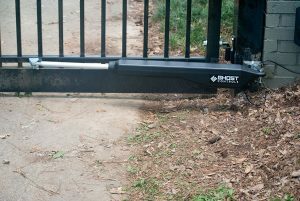 Soft Start : Make sure your solar gate openers have a soft start ability. 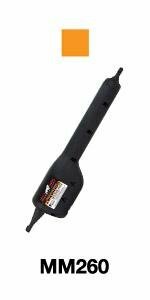 This feature will help prolong the life of your solar gate opener hardware. Automatic Gate Close : Your Solar Gate opener should be programable to automatically close on reaching the fully open position. 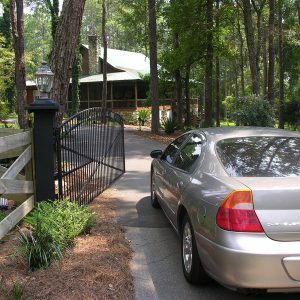 The remote gate opener should also be able to close the gate sooner than that. Obstruction Sensor : The Solar gate opener must have an in-built safety sensor that senses when an obstruction is in the way of the gate. This sensor would cause the gate to stop and reverse its direction, much like your garage opener. The obstruction sensor setting of your solar gate opener should be programable so that it could be switched off if you desire. Can you open the Solar Gate Opener without an entry transmitter / remote ? An excellent feature to have would be a weather proof Digital Keypad mounted near or on the post of your Solar Gate. Such a digital keypad allows easy entry codes for different family members, Fedex and UPS trucks and employees. What kind of batteries do Solar Gate Opener use? Solar Gate Openers are mainly operated by Marine type Lead Acid / AGM batteries. 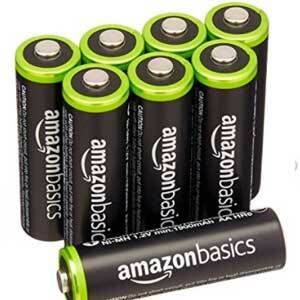 These are usually 12 volt batteries with capacity starting from around 7 Amp hour. They are available in most hardware stores. It is a good idea to add an additional battery to the kit battery that comes with the Solar Gate Opener, especially when you are in a cold region. Make sure your Battery enclosure has the space to add an extra battery. You don't require an electrical connection for your gate. No need trench and drop an electric line to your gate. Your can claim a the federal solar tax credit and reduce the cost of your Solar Gate Opener. Consult with a tax professional to claim the credit. Solar Gate Openers work very well in sunny locations as well as for light duty gate opening requirements. You have the ability to add extra solar panels and batteries in increments ​if your load increases. Solar Gate Openers are not a viable solution for heavy duty gate applications with larger cycles of usage. If your usage cycles increase you will have to add additional solar panels and batteries and that can add to your costs. You are hampered by bad weather and lower solar access - you will have to make sure the panels are in a sunny area. Even though your gate could be in the shade, your solar panels can be placed at a distance where there is greater solar access. Please share this article with friends who might like it. 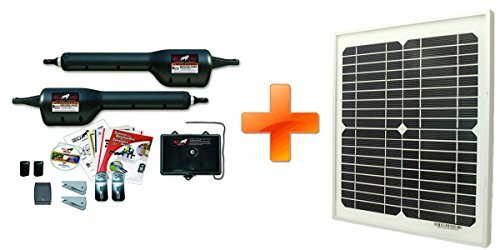 The Mighty Mule EZGO Single Swing Gate Solar Gate Opener kit package consists of the Solar Gate Opener, a 5 watt Solar Panel and Two Remotes. 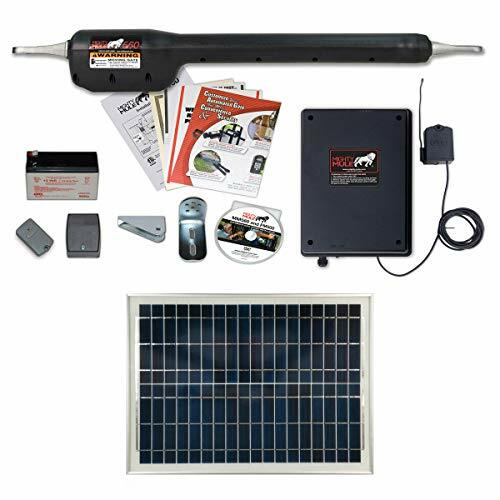 The Mighty Mule MM562 Heavy Duty Dual Swing Solar Gate Solar Gate Opener kit package consists of the two Solar Gate Opener motors, a single button remote, the AC transformer, a 12 volt 7 amp hour Battery, Control Box, and all required hardware. It’s perfect for all kinds of Dual Swing Gates such as Chain Link, Tube, Panel, Vinyl, Wood or even Ornamental. The constraint is a maximum gate length of 18 feet or weight of 850 lbs. The Solar Panel must be purchased separately. An interactive DVD as well as Youtube Videos make installation very easy. 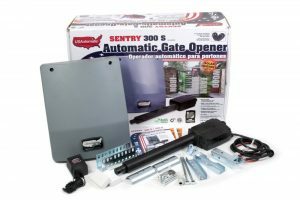 The USAutomatic 020320 Sentry Single Swing Solar Gate Solar Gate Opener kit of an AC Transformer, the Gate Opener, two dual button transmitters, Battery Charger, installation DVD with mounting hardware. It’s great for Single Swing Farm Gates upto 20 feet or ornamental iron gates upto 12 feet in length. 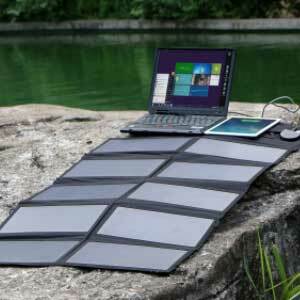 The Solar Panel must be purchased separately.